For the past two and a half years, the United Nations has asked people around the world to tell them what matters most to their lives. Thus far, 4.9 million of the 7.5 million people who voted in the MY World Global Survey have chosen “A better education”. This trend is true regardless of age, gender, education level and is similar across most countries in the world. 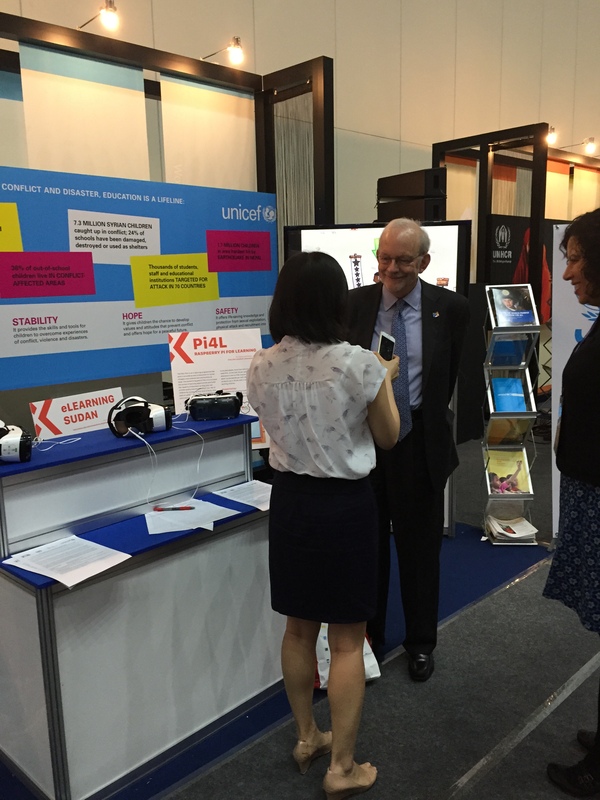 From May 18-21, we partnered with UNICEF in the production of an exhibit to amplify the voices of people around the world at the 2015 World Education Forum in Incheon, South Korea. The forum, co-convened by UNDP, UNESCO, UNFPA, UNICEF, UNHCR & UN Women, brought together stakeholders from all sectors to look at achievements and shortfalls from the Millennium Development Goals and the Education for All targets. Participants agreed on the Incheon Declaration which sets out a renewed vision in education, one that aims to ensure inclusive and equitable quality education and promote life-long learning opportunities for all. 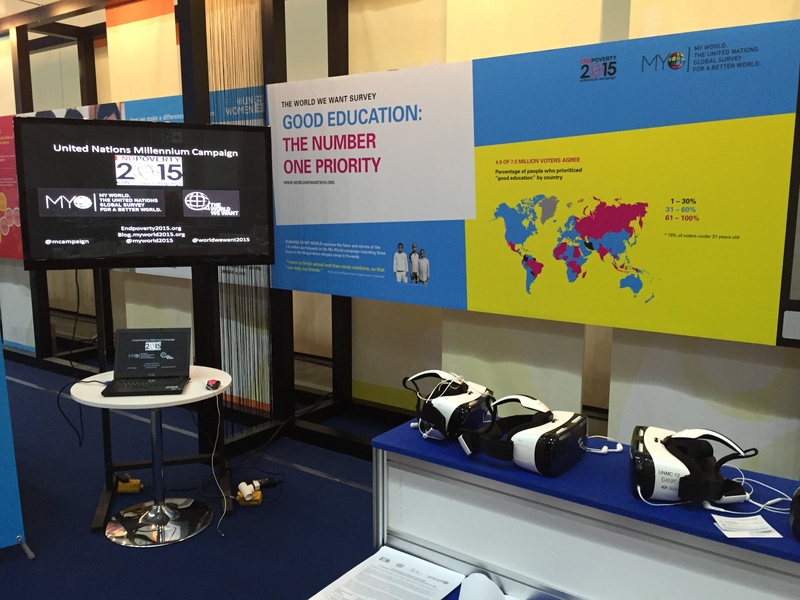 The exhibit featured data visualizations on the importance of education for people around the world, such as the MY World dataset, MY World priority heat map, UN Global Pulse MY World Twitter mapping, World We Want key word visualisations, and stories of why people voted for education through the Humans of MY World communications campaign. 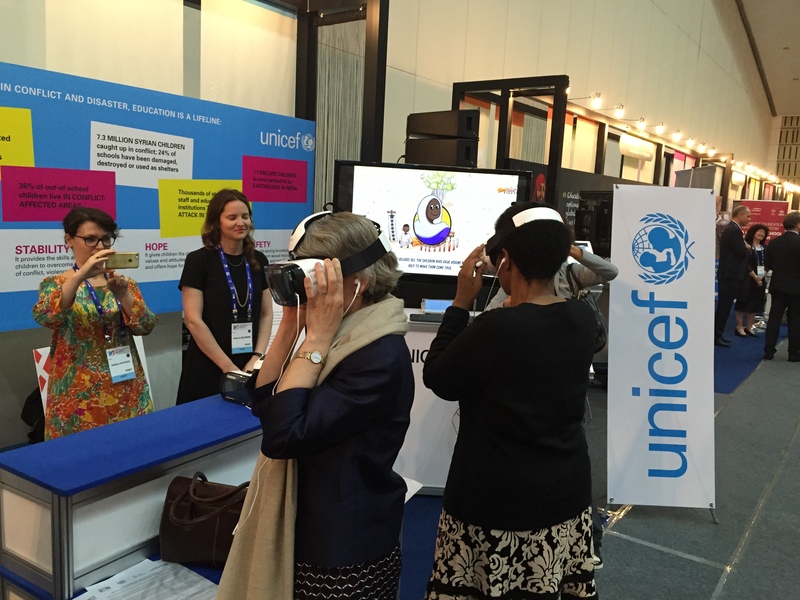 UNICEF showcased two innovations targeting the out-of-school children: Raspberry Pi Learning Initiative from Lebanon provides non-formal education to the millions of displaced children as a result of the Syrian crisis, and E-learning, offers accelerated learning opportunities to some of the 1.8 million out-of-school children in Sudan. Some kids don’t go to school. They want to wait until we are back home in Syria. I think it’s silly to wait. How will they remember anything? And there is nothing to do here anyway. Volunteers engaged young people in Azerbaijan in an open conversation about their priorities for the post-2015 development agenda. Thanks to the support of over 700 partners worldwide, MY World, the United Nations survey for a better world, has mobilized over 850,000 participants in 194 countries. By September 2013, we will have reached 1 million votes and this turning point provides the perfect backdrop for a MY World Partner Recognition Event and MY World Award Ceremony. The MY World Awards will recognize the work of those partners who have stood out for their performance in the promotion of the MY World survey at the national or international level. Mumbai, 27 May 2013 – The United Nations has invited citizens from around the world to vote on the issues that make the most difference to their lives. Over 560,000 citizens from 194 countries have already voted in one of the largest global surveys ever undertaken, providing real-time and real-world intelligence on what people think are biggest challenges. Author UN SDG Action CampaignPosted on May 28, 2013 Categories Field Story in Asia, Media coverageTags Department for International Development (DFID), Geetanjali Master, india, Lopa Ghosh, Louis Georges Arsenault, Minar Pimple, Post 2015 Development Agenda, Priyanka Chopra, UN Millennium Campaign, UN Secretary General, UN Secretary-General’s High Level Panel, Unicef, Wada Na Todo Abhiyan. The United Nations in the Philippines marked a difference. From left to right: Ms. Eden Lumilan, UNCO Coordination Analyst; Mr. Christopher Rollo, UN-HABITAT Philippines Country Programme Manager, Ms. Ugochi Daniels, UNFPA Country Representative; Mr. Aristeo Portugal, FAO Philippines Assistant Representative (Programme); Mr. Dragoslav Djuraskovic, WFP Head of Logistics; Ms. Teresita Bagasao, UNAIDS Country Coordinator, Mr. Lawrence Jeff Johnson, ILO Country Director; Mr. Marco Boasso, IOM Philippines Chief of Mission; Mr. William Wairoa-Harrison, UNDSS Security Adviser; Dr. Sigrun Roesel, WHO Representative; Mr. Daniel Toole, UNICEF East Asia Regional Director; Ms. Luiza Carvalho, UN Resident Coordinator; Mr. Tomoo Hozumi, UNICEF Philippines Country Representative; and Mr. David Carden, Head of UN-OCHA. My World in the Philippines is going full steam ahead following a successful partnership launch and media briefing last month. From less than a thousand votes in March, the Philippines now ranks 3rd, with more than 18,000 votes.